Collection of the world’s fastest, coolest and the most unusual police cars that help officers quickly reach the scene of an incident. Texan Sheriff is the owner of the fastest Police Hummer H2 in the world equipped with a 7.0 liter supercharged engine and a top speed of over 150 miles per hour. This extensively modified Porsche 911 Carrera S is capable of over 186 mph and sprinting to 60 mph in just 4.5 seconds. 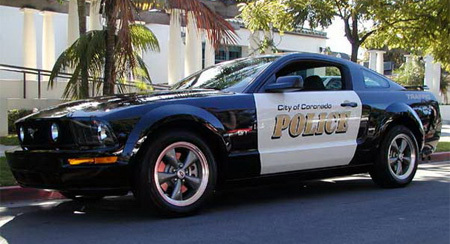 Menacing looking Ford Mustang police car spotted in Colorado, USA. 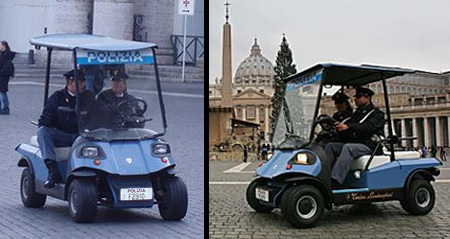 Police electric buggy spotted in Vatican, Italy. Mercedes-Benz E-Class police car spotted in Hamburg, Germany. 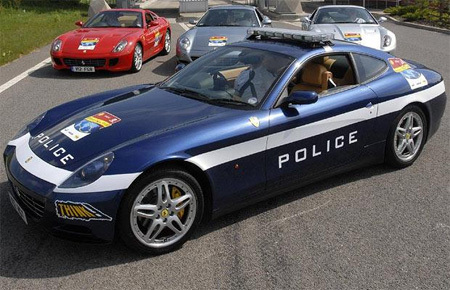 Ferrari 612 Scaglietti with police car colour scheme was driven by police officers at the front of the Ferrari UK tour from Belfast to London. 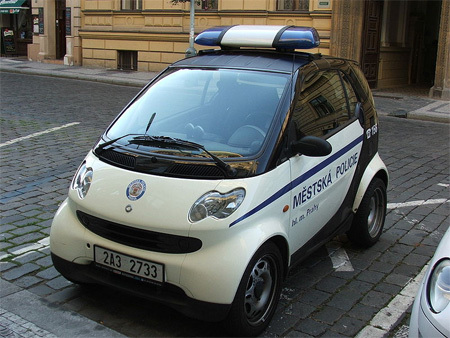 Czech Smart Fortwo police car spotted in Prague. 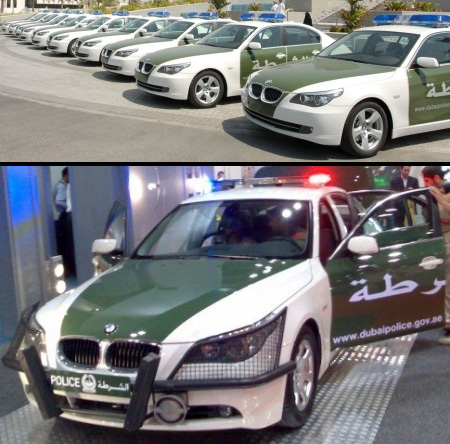 Dubai Police has taken delivery of 101 BMW 5-Series cars, half of which will be used as patrol cars. Corvette Z06 police car spotted in Bloomfield Hills, MI, USA. 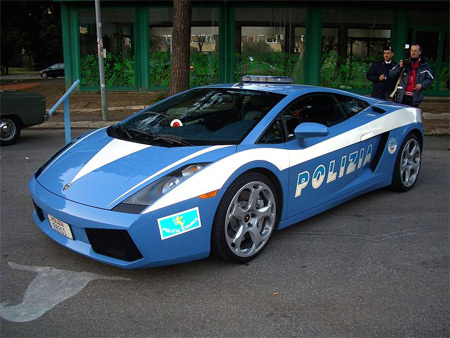 In December 2004, two Lamborghini Gallardos were donated to the Italian police in honour of the force’s 152nd anniversary. Diggin’ the fleet of BMW’s keeping the peace, never thought I would see a 5 series with brush guards, lol awesome. Nice cars.. if I want to drive these cars.. I should become a police then lol..
A Supercharged 150MPH Hummer ? Why are americans so intent on killing the planet? Why on earth would a police officer need a hummer? 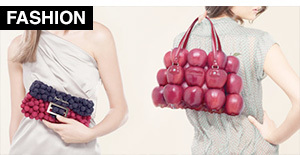 So is kind of 2 in one… multifunctional. 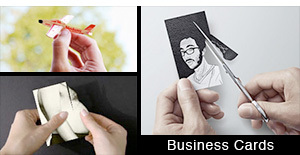 I find that a very positive design asset. … but really why some people cant figure out this obvious things alone and post silly questions and comments. Aw its a sin t see that lambourghini all nice there considerin how torn t pieces it was in that crash week or so back..
What is so special on a E-class Mercedes? 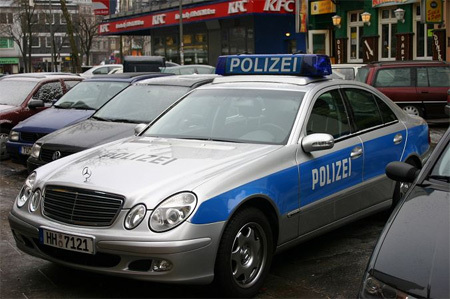 Mercedes-Benz E-Class police car is totally normal in germany (also BMW). 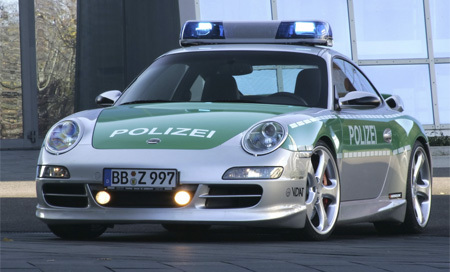 Unusual AND expensive, deluxe and way too cool Police Cars. I won’t dare a race against any of these, well, maybe the Buggy xD. -What’s the need… i say…. Uh, ‘Coronado’ is not ‘Colorado’. I think that if Colorado looked like that photo, maybe even Jim Inhofe would be convinced of the reality of global warming. Good Call JLH! That said, I don’t think it would be that odd to see a Ford Mustang as a cop car here in Colorado. They are fairly common here – along with cops with mullets. Sorry but Vatican is an independent country, it is NOT IN Italy. It is just surrounded by Italy. Now the Lambo is no more ! seba you douche, like a hummer is the only vehicle that can go both terrain and freeway? There are plenty of jeeps and cars that can do that, having a hummer as a police car is just plain stupid. Wow, with the exception of the smart car and the electric rides, care about the environment much? Come on, a Hummer? 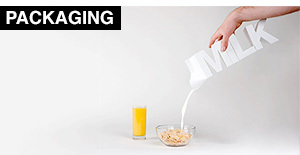 I’m very thankful they are no longer making them. Did you know that the American government gives tax breaks if you purchase one? Not only does it get the worst gas millage (under the legal limit) the government is encouraging it. Just another reason our government is so corrupt. Hummers are awesome…!! 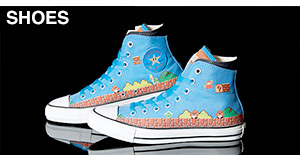 They are great for running over environmentalists. Keep making them and we’ll keep buying them… Big, muscle cars will never go away.. Yeah! The Hummer is most likely an educational car. 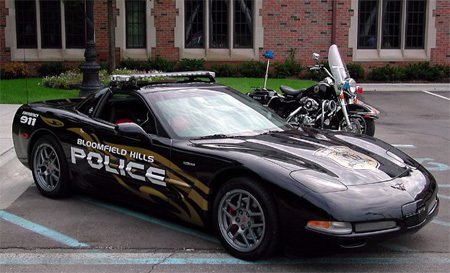 Many Police Departments have Special cars that are used for outreach programs. God forbid a guy that puts his life on the line for your safety get a nice car to drive. Going offroad with those rimps is a bad idea. Colorado Highway Patrol used to have a confiscated Countach, but it was apparently to expensive to maintain. Mercedes and BMW are more common in Europe than toyota and fords are in the States. Polezei get these donated to them fairly often. I totally understand why they’d pick a Hummer over a Jeep or other off-road vehicle. 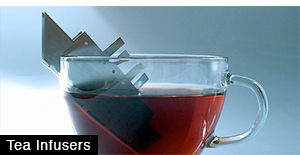 The other’s are well-known for flipping over. Not a good idea in the event of going up steep heels or chasing a suspect. I’m sure there are reasons why certain vehicles are chosen – performance, availability, cost, etc. 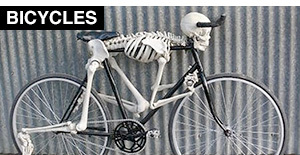 The same reason some policy ride motorcycles, some ride horses, some still walk their beats. If I had to choose – I’d choose the Mustang – the car, not the horse! I dont think I would stop if a FORTWO tried to pull me over. P.S. TEXAS GIRLS rock way more than california girls. we just don’t need to proclaim it for people to know its true. Look at the cars in Dubai.UAE. Cool, Dubai has got to be the most modern city in the world. That Hummer Police truck and his owner has “douche” written all over! I think the hummer just makes sense considering some of the areas that a county sheriff has to get in and out of is pretty far beck into the woods. Some of those backroads are rough and sometimes there is no road at all. IT makes even more sense in Texas which has a lot of desert areas. The trouble is that it is only a Hummer H2 which is little more then a SUV that looks like a hummer. The Hummer H1 was the best model when it comes to a rugged off road machine. I used to drive a hmmuvee when I was in the army and trust me that thing is some ride that you just have to experience to understand. Those things will get you where you want but they are defenately not built for comfort. If the environmentialists want people to drive cars that don’t use fuel they just need to figure out how to get as much hourse power out of the electric engine that you can get from an engine that runs on gas oh and make it rumble like a racecar. Often anyone who likes speed or power also wants that mean sound and feel of a traditional gas engine and further more they usually also like to get under the hood themselves because thhey love to work on the mechanical engine of a traditional car especally those people who love classic cars. Yeah Texas chicks are awesome as long as you get out of their way when they are angry. Riding a bull would be easier then dealing with a pissed off woman from Texas. I love their attitude and their accents. I love strong women who don’t put up with crap. I just hate to piss off such a woman. It starts with a vehicle that is seized from either a worthless drug dealer/user, or a drunk who can’t stop driving and risking everyone else’s lives. When they’re stopped and the vehicle is seized, it becomes the police department’s property, based on legislation passed by their respective state. The department can then auction the vehicle to fund their budget, or use the vehicle in their own fleet. Which, if you haven’t figured it out yet, saves tax payers a bunch of money. When the vehicle is put into the fleet, most things aren’t changed except for the graphics. For example, the Hummer was probably seized with a “souped up” engine and fancy rims, and were left on to save more money by not changing things out. And then the department usually uses it for some specialized purpose or detail. So, maybe this will help all those whiners understand the Hummer was probably a cost savings and not an intentional plot to “damage” the environment. And maybe some people could show a little more respect for those that risk their lives. Go Texas! And Be Safe out there, there are too many crazy people. I am so glad some people have a brain & respect the law, and they can explain to Obama voters how the real world works. We live in Georgetown Tx. The Mustang is the highway patrol is the one we see a lot of !! However the Dodge challender is being used a lot. The cops are saying they are fast enough and get good Gas mileage. The Chevrolet Corvette is not needed. The mustang will do especially the new 2011 V six with over 300hp if needed. Oh it gets over 30 Miles per Gal when driven right…. very cost effective !!! The Dodge works well the Black on Black with Black decals stop a lot of cars that’s for sure… Te new Mustang is where i would like my tax dollars to go !!!! The Humvee is a wonderful idea, with it’s modifications. It would preform well on the interstate, yes, but it’d excel offroad. The Humvee’s wide wheelbase makes it almost impossible to flip. It can go where other cars can’t… See where I’m going. Daemyrs, the Insomniac, signing off. The BMWs and Ferrarie look freaking sick and dope! Id so be a cop in other countrys!